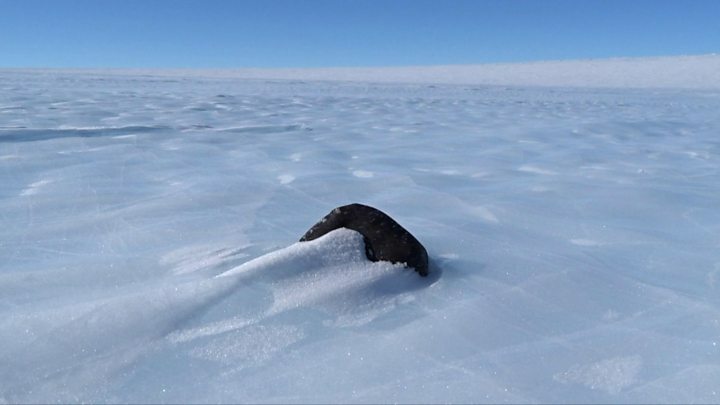 The first British-led expedition to gather meteorites in the Antarctic has returned with a haul of 36 space rocks. Manchester University’s Dr Katherine Joy was dropped in the deep field with British Antarctic Survey guide Julie Baum for four weeks. The pair spent their days near the Shackleton mountains running across the ice sheet in skidoos looking for out-of-place objects. The meteorites ranged from tiny flecks to some that were as big as a melon. Some two-thirds of the meteorites in the world’s collections have been picked up in the Antarctic. It’s the contrast of black on white that makes the continent such a productive hunting ground. “As soon as you spot a black rock you know. You dart towards it and your heart picks up a beat,” Dr Joy told BBC News.